It's that time of year again...tournament time. I know this year hasn't been what any of us in Orrville thought it would be, but hopefully we'll still show up at Wooster High School (and Triway High School for the girls) to support our Red Riders. 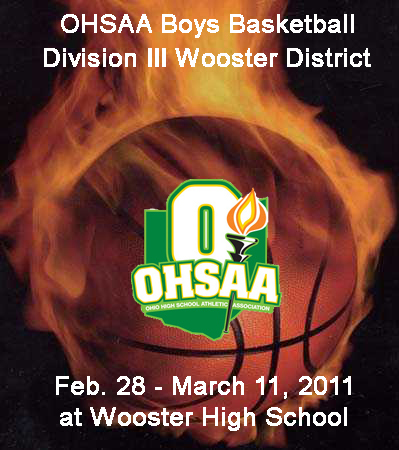 It's also time for the 2nd Annual Wooster District Preview, brought to you by this site and Andrew Marcum's OhioBasketball.net. Andrew does a great job in tracking local basketball so we'll once again put our heads together and see if we can provide some sort of roadmap. Call it a fan guide if you will. We'll do it a little differently than last year. First off, we'll do team capsules for each team, with records, coaches, key wins and thoughts on each team...just like last year. What will be different this year is that we're going to do our predictions round-by-round, not all at once like we did last year. As teams we predicted to win got beat, the post turned into a big mess. So after the sectional semifinal round, we'll make our predictions for the sectional championships...and so on, until the district title game. So keep checking back after the end of each round. Good luck to all the teams, and here's hoping for an exciting two weeks of basketball. There is one and only one clear-cut favorite in my opinion – the Hillsdale Falcons. They are 15-2 with losses to preseason co-favorite Dalton by 3 then at co-WCAL leader Northwestern by 10. They are led by a duo of frontcourt players who are not only big but run the floor and do all the little things for the Falcons. Surrounding them are several key role players who all seem to be disciplined and get the job done. They are my pick to win the district. This should come as no surprise. They may have the best player in the tournament in sharp-shooter Brennan McKean. The Huskies potentially have a 2nd round game against Triway, which beat them by 8 on their home court in the season opener. Thoughts: Seven losses by a total of 41 points (6 points per) makes this Smithie team real sneaky. I think when it comes down to it, they lack the balance of Hillsdale and the game-changer that Northwestern has in McKean, but they've played both to the final minute in all four games, so they've got a punchers chance. Thoughts: Maybe the most respect a 6-13 team has ever gotten in terms of seeding. Right now, tradition is about all the Riders have going for them. Still a team capable of putting together a deep run, but lack of outside shooting makes this team prone to scoring droughts. This is a team that simply can't fall behind by more than 6 or 8 points. Thoughts: Don't know much about their schedule, but when I see wins over Christian Community School and Lake Ridge Academy, it doesn't impress me much. They may get past Norwayne in round 1, but can't see them going much farther. Thoughts: Bobcats have "sleeper" written all over them. Two wins over Dalton, a 4-point loss to state-ranked Manchester, and two losses each to Hillsdale and Northwestern by a total of 19 points tell me this is a team that nobody wants to play. But a bad loss to Chippewa and two 10+ point losses to Smithville tell me it depends on the night for the 'Cats. They can hang, but do they have the players to hit the big shot down the stretch? Thoughts: Out-of-character season for the Titans. Lots of athletes (Polen, Carmichael, Grenert, Wharton) but it's just never came together for them this year. Still a dangerous team that can have it all click at anytime. Double dangerous when they can take the air out of the ball with the classic "four-corners" offense. Thoughts: Losers in 7 of 8 games down the stretch has the Mustangs limping into tourney play. Haven't scored over 50 in last three games. Thoughts: Four wins over teams in division 1 and 2 would normally impress me, but a 20-point loss to Hillsdale tells me this team will be lucky to stay with Smithville in round 1. Thoughts: After starting 1-7 to start the season, the Pirates finished up 6-5. Still a below average team against a soft schedule. Thoughts: Lost 11 of first 13 games. Have won 5 of 6 heading into final game of the season. A tale of two seasons for sure. Might be good enough to beat Loudonville, but Hillsdale awaits. Thoughts: The only team in the district without a win over a fellow district member. One win is about all they could hope for. Even with the impressive win over Clear Fork, they weren't competitive in a lot of their losses and have only scored 60+ once this season. Thoughts: A win over Central Christian, Kingsway Christian and two wins over Chippewa....that's it for the Bears. Not even a "fee-good" loss on the schedule. Might be one-and-done for the Bears. Thoughts: Four of their five wins being over Christian schools (Central, Kingsway, Heritage & Lake Center) earns the Chipps the 14th seed. Would be one of the biggest upsets in local history if they could beat Orrville in round 1. That's it. We'll have some overall thoughts on the district and our predictions for Round 1 in another day or so. Feel free to add your own comments or thoughts on the district.